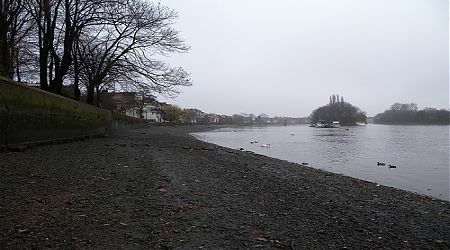 This zone, which includes the small island of Oliver’s Ait, was recorded by the Thames Archaeological Survey during the 1990s and the TDP / FROG have undertaken further survey at the site. Features of interest include a number of historic public houses and private residences, evidence for localised industry in the form of brewing and a large number of access features including landing stages, stairs and causeways. Features recorded at the site included sections of the river wall (including a small area of surviving Tudor brickwork), revetments and drainage features. Check out the articles below to learn more about Strand-on-the-Green.